Instagram has launched a standalone video app called Boomerang, which can stitch together a series of photos to produce a GIF-style clip. You don’t have to be logged in to use the program, and it doesn’t even require an Instagram account. The app is incredibly simple to use; once downloaded, simply aim a smartphone camera at something (or use the selfie mode) and hit the button. Boomerang will shoot a one-second burst of five photos that are turned into a silent video that plays forwards and then backwards in a loop, which is where the Boomerang name comes from. Once you create a Boomerang, it will be automatically saved to your camera roll and can easily be shared on Instagram, Facebook, or elsewhere since the app doesn’t have a feed of its own. Putting the clip on Instagram will double its speed, meaning it will play forward and backward in about a second. 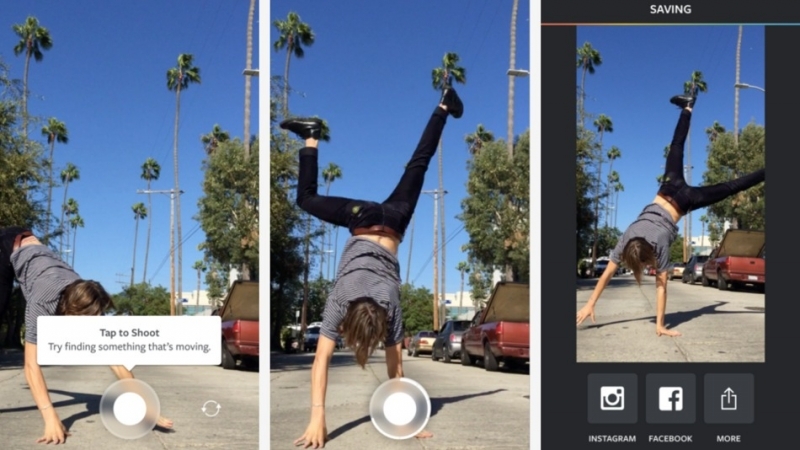 Boomerang is the third standalone app to come from Instagram. The company has previously released Layout, a program lets users combine multiple photos into a single image, and Hyperlapse, an app for capturing high-quality time lapse videos even while in motion. Boomerang’s product manager, John Barnett, told TechCrunch that the app was originally conceived by a group of just five people from Instagram’s Android team at a hackathon in July. “It was something we built just for fun for us to play with as a team” he said. Eventually the employees realized that the app might be well-received by the public, and so it became full, standalone product. Boomerang is available now on iOS and Android. Barnett pointed out that the iOS version will make things look a little better because it does image stabilization in a way Android doesn’t, meaning clips shot on an iPhone shouldn’t make those who view them feel dizzy.